The following steps are necessary to track the energy saving progress in building stocks. The rules may be applied on different scaling levels: for national or regional building stocks, for building portfolios of housing companies, for urban districts, ... . They will be basis of the pilot actions being implemented in the course of the IEE EPISCOPE project (see page "Monitoring Pilot Actions"). Classify the building stock according to energy relevant characteristics (age, size, ...) and try to determine frequencies of buildings and systems. 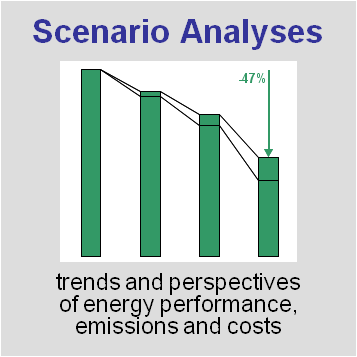 Determine energy relevant data of buildings and supply systems. Possible sources may be building stock samples, surveys, EPC databases, ... . If on a regional level detailed data (e.g. about refurbishment state) are not available use national values for a start. If no reliable statistical data are available begin with a small sample of exemplary buildings. Define short-, mid- and long-term energy performance targets considering European, national and corporate strategies. Consider the relevant national climate protection targets as well as the national NZEB definition. Define refurbishment strategies for showcase buildings considering standard measures (typically applied in practice or minimum legal requirements) as well as very ambitious measures ("best technology") and calculate energy savings. Try to determine the expectation values of the real consumption of the buildings in the existing and the refurbished state. Discuss the different refurbishment standards with the involved key actors and fix the variants for scenario calculations. Project the development of the building stock for the next decades assuming that the current refurbishment rates will be maintained in the future (trend scenario). Identify possible refurbishment strategies for different building stock subgroups. Consider boundary conditions for energy upgrades as far as possible (e.g. easy- and hard-to-treat building groups). Discuss the implications for the target groups and key actors (building owners, policy makers, ...). Try to determine the actual rate of measure implementation in the considered building stock (differentiated by building type and energy carrier, as far as possible). Try to determine the actual energy consumption of the building stock (differentiated by building type and energy carrier, as far as possible). Try to embed the collection and evaluation of main energy performance indicators in mechanisms which are running anyway due to other reasons than building stock monitoring (e.g. energy billing, portfolio management of housing companies, ...). Emphasize the benefit to enable a comparison of the individual home with the entirety of buildings / dwellings and use this aspect as teaser. Compare the actual with the planned EPI progress (rates of refurbishment, quality of measures, actual energy consumption). In the event of non-fulfilment: Help to implement corrective actions or give adequate advice to the key actors. Use success for promotion of further activities and for creation of enhanced demand by owners and tenants. Measure the impact of corrections and promotions, as far as possible. 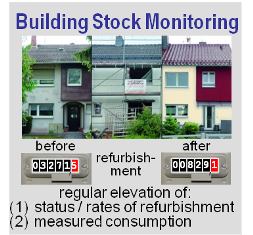 The main purpose of installing monitoring processes in building stocks is to determine the rates and effects of energy refurbishment and to compare them with the given targets. In case of non-fulfillment there is a need to broaden and intensify the operation of political instruments and to measure the resulting impact. However, metering the actual impact of policies and measures is not a direct subject of the EPISCOPE project but of course is the intrinsic driving force for monitoring.